( Dogbane Family ) Subfamalies: nil. Family Description: Small trees, shrubs, or herbs, with poisonous latex. Leaves simple, exstipulate, with glands in or above the axils. Flowers solitary or in cymes, hermaphrodite, actinomorphic, 5-merous. Corolla with oblique lobes, contorted in bud. Stamens 5; anthers introrse, closely surrounding the stigma. Ovary superior; carpels 2, usually free, united by a single style above. Fruit of two fusiform follicles, usually opening by the ventral suture; rarely only one follicle developing. ( Honeysuckle Family ) Subfamalies: nil. 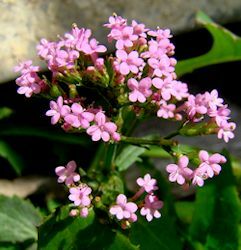 Family Description: Woody perennials (rarely herbaceous) with opposite, usually exstipulate leaves. Flowers (3-)5-merous, hermaphrodite, epigynous, usually actinomorphic. Calyx small; corolla-tube variously developed. Stamens (4-)5, epipetalous, alternating with corolla-lobes; anthers longitudinally dehiscent. Ovary 1- to 5-locular; style 1 or absent; stigmas free or connate. Ovules 1 to numerous, pendent, anatropous. Fruit a drupe, berry or nutlet. Seeds endospermic, with a small, straight embryo. ( Gentian Family ) Subfamalies: nil. Family Description: Glabrous bitter-tasting herbs. Leaves opposite (very rarely some alternate), entire, exstipulate, usually sessile and often connate at the base. Flowers 4- to 5(to 12)-merous, actinomorphic. Calyx more or less deeply lobed. Corolla-lobes contorted in bud. Stamens inserted on the corolla-tube. Ovary superior, 1-locular, with 2 parietal placentae, rarely almost 2-locular owing to the intrusive placentae; ovules numerous. Fruit a septicidal capsule. ( Olive Family ) Subfamalies: nil. Family Description: Usually glabrous trees or shrubs. Leaves opposite, rarely alternate, exstipulate. Flowers hermaphrodite, rarely unisexual, 4- (5-) to 6-merous, actinomorphic. Calyx campanulate, often small. Corolla sympetalous or polypetalous, rarely absent. Stamens 2, often inserted on the corolla-tube. Ovary superior, 2-locular; style usually short or absent; ovules usually 2 in each loculus. Fruit a loculicidal capsule, a samara, a drupe or a berry; seeds 1-4. Family Description: Herbs or dwarf shrubs. Leaves nearly always opposite, simple, entire; stipules separate, connate or divided, sometimes leaf-like and then forming whorls of 4-12 apparent leaves. Inflorescence thyrsoid, paniculate or corymbose, sometimes condensed to a spike or head, or reduced. Flowers actinomorphic, usually hermaphrodite. Sepals usually free, sometimes reduced or absent. Sympetalous; corolla hypocrateriform, infundibuliform, cupshaped or rotate. Stamens epipetalous, alternating with the lobes of the corolla. Ovary inferior, usually 2-locular and with a disc; loculi with 1-numerous ovules. Style simple or 2-fid. Fruit dry, dividing into mericarps, or fleshy. Seeds endospermic.